In From Russia with Love, the filmmakers ripped entire scenes from the Hitchcock catalog. Alfred Hitchcock brought to the screen iconic spy characters that inspired the creation of Ian Fleming’s James Bond, Robert Ludlum’s James Bourne and the novels of John Le Carre. But by the 1960s, Hitchcock had tired of that character, feeling that the Bond films had become a “comic book” version of his original idea. It has been rumored that Hitchcock was the first person to be approached to direct the first movie in the Bond series, Casino Royale (1967). However, according to Gary Giblin's book Hitchcock's London, he wrote a letter to Ian Fleming's biographer stating that he'd never been offered, nor had he declined, the opportunity to film Bond. As the movies rolled out, it irked Hitch to see the 007 franchise plundering his films for ideas. 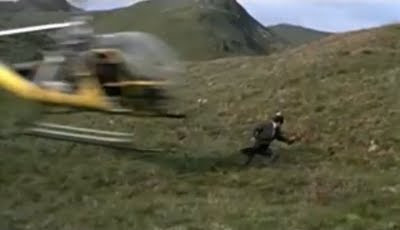 For example, the helicopter duel in From Russia with Love blatantly apes the crop duster scene in NxNW. In the final analysis, From Russia is more a pastiche of Hitchcock's films than it is an original work. Typically, the women Bond sleeps with offer little more than a hint of the possibility of a real relationship, thwarted as the pair are by Cold War exigencies. Hitch wanted to delve deeper into the implications of such stressed-out relationships. The result? 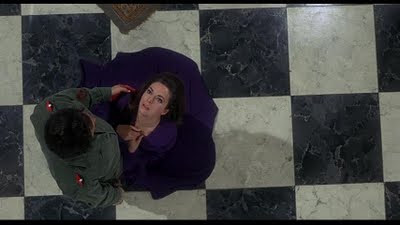 Torn Curtain (1966), which emphasizes, in Hitch’s words, “the problem of the woman who is associated, either by marriage or engagement, to a defector.” Hitch originally wanted Cary Grant for the role, which would have brought it much more in line with a typical Bond character. Instead, He was forced to accept Paul Newman, who, though capable as an actor, didn’t resonate for Hitch, to put it mildly. 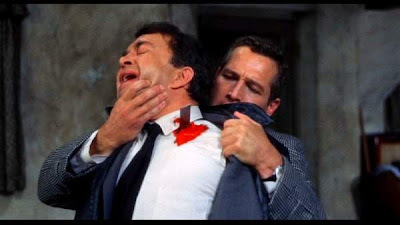 As this scene from Torn Curtain shows, murder isn't as easy as James Bond and others would make it look. For a treat, catch the scene here on YouTube, which features Bernard Herrman's original score. In this poignant scene, Cuban revolutionary leader Rico Parra (John Vernon) must kill his lover (Karen Dor) when it is revealed that she has been giving state secrets to the West. In these years, he actually gave thought to resurrecting Richard Hannay of The 39 Steps, adapting his short story, “The Three Hostages.” Though the project didn’t go far beyond some research and discussions, Hitch was thinking deeply about the past and future of the spy movie — and how he could shape it. Whereas Agent 007 coolly executed scores of faceless enemy agents, Hitchcock, in these later films, foregrounded the personal devastation that results from such killings. What's more, he moved far beyond the good guys vs. bad guys scenario of his earlier spy films to a more nuanced depiction of all players -- regardless of their political loyalties. Though Torn Curtain and Topaz aren’t Hitch’s best work, they definitely point up the possibilities that the director had in mind. Sadly, it seems, most movie spies still follow the old Hannay/Bond pattern. To be sure, these characters endure. Still, I wonder what spy movies would be like now, if time, age and Lew Wasserman's tentacles hadn’t been closing in on Hitch's powers. Reading the first lines of this post, I'm not surprise that Alfred Hitchcock was ripped off. A lot of people in Hollywood have and continue to rip Hitchcock off. He was the one with original ideas and most people in Hollywood don't have that pizzaz. ...Joel said, "As the movies rolled out, it irked Hitch to see the 007 franchise plundering his films for ideas. 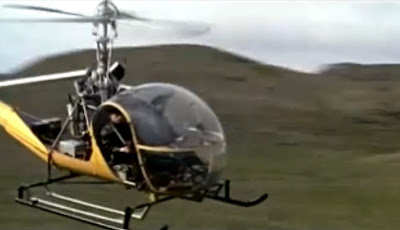 For example, the helicopter duel in From Russia with Love blatantly apes the crop duster scene in NxNW. In the final analysis, From Russia is more a pastiche of Hitchcock's films than it is an original work." Oh! 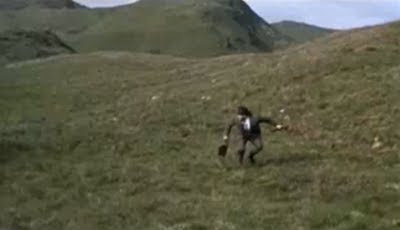 Yes, that scene most definitely bears a "striking resemblance" to the scene in Hitchcock's North by Northwest. (I most definitely, don't blame him(Hitchcock) for being irked, but really there is no comparison between both scenes. (Other than the fact, that both men are running in a field or a vast desolated area while being pursued by a helicopter in both films. Goldfinger, To Russia with Love, and Die Another Day, but on the other hand I have watched almost all of Hitchcock's films. "Though Torn Curtain and Topaz are not Hitch’s best work, they definitely point up the possibilities that the director had in mind." Speaking of, Hitchcock's films Torn Curtain and Topaz I just recently watched both films for the first time and found the former a "tad" more interesting than the latter. "Still, I wonder what spy movies would be like now, if time and age hadn’t been closing in on Hitch's powers." Hmmm... Joel, that is most definitely something to ponder when it comes to spy movies today. Thanks for your very interesting comments! As far as sequels go, I'd love to see "Rear Window II" - L.B. Jeffries and Lisa Fremont continue to work out their love issues - but with the help of a professional counselor. Meanwhile, Lars Thorwald escapes from prison to hunt him down and L.B. discovers the identity of JFK's 2nd killer in a news photo he'd taken for LIFE magazine. Dial N for Not Really Dead. Joel said, "As far as sequels go, I'd love to see "Rear Window II" - L.B. Jeffries and Lisa Fremont continue to work out their love issues - but with the help of a professional counselor. Meanwhile, Lars Thorwald escapes from prison to hunt him down and L.B. discovers the identity of JFK's 2nd killer in a news photo he'd taken for LIFE magazine. Well, Joel anything is possible just think of these words...Anthony Perkins, Vera Miles, Psycho II and Psycho III, Tippi Hedren, Birds II ...When it comes to your suggestion for the sequel storyline to Hitch's "Rear Window" all I can say is...LOL! Wow, I wasn't aware of the fact, that a remake of Hitch's The Birds was in the works in 2007.
thanks for this, Joel. i'm sending it to a friend who recently saw '39 Steps' for the first time. Kind of a harsh words against FROM RUSSIA WITH LOVE that has a rather brilliant story and characters. Yes the Helicopter scene was an obvious rip off from NBNW but that was the only one. "Sadly, it seems, most movie spies still follow the old Hannay/Bond pattern." Since Casino Royale came out the cinematic James Bond is alot more in line with Fleming's character, quite aware of what he does and it gets to him. A Welcome change after Bond has become a charicature of himself. Today I saw Hitch's Torn Curtain. Excellent film to say the least. I didn't have too much of a problem with Paul Newman. No he didn't have that Cary Grant spark but the guy was getting too old to play the romantic lead. Thanks for your great comments and sorry it's taken so long to reply. I should probably mention that I enjoy a Bond film as much as anyone. And I think Daniel Craig may be the best Bond yet. But watch "From Russia with Love" back-to-back with NxNW. The borrowings don't stop with the helicopter scene. I have seem both films a few times. I struggle to think what else was plagerized from North by Northwest. From Russia With Love stayed rather close to the book which was published in 1957, two years before North by Northwest. The biggest changes in the film adaptation was making SPECTRE the main villian and everything after Bond and Tatiana escape from the train. Interesting that Hitchcock wanted "Topaz" (a movie I have not seen) to be a story of "espionage with an emotional relationship". "Notorious" did manage to convey a very strong love story. But few espionage thrillers succeed in that way. I am a huge Graham Greene fan. His stories carry such emotional resonance. I loved the filmed version of GG's "Ministry of Fear". Ray Milland was so great in that at portraying a very fragile masculine vulnerability . As I recall, it did have a compelling romantic subplot. I hate to quibble with your love of Hitchcock. Although I greatly admire his skill as a director, many of his characters are rather dull to me. That seems to be a problem endemic to thrillers. "Notorious" being an exception. But I don't blame Hitch for that. Maybe it is very difficult to write a suspenseful plot, and at the same time dwell on character development? That must be, because it is done successfully so infrequently. I agree with your quibble! Hitch's characters weren't as 3 Dimensional as others -- though he did make huge improvements in that area during his Selznick years. I think Hitch was more concerned about the audience reaction in general than in creating richly developed characters. Hmm... This could be the grist for a new blog post. Sorry not keen on Bond movies - too flash and mainstream for me. I had to read this post to learn how you were connecting Hitchcock with Bond movies, interesting.